The Sony 35mm f1.8 DT SAM Lens is a bright, very wide aperture portrait lens, also suitable for low-light shooting and general/snapshot applications. 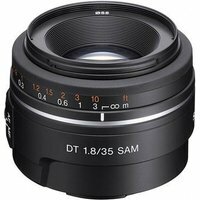 Its DT lens design is specifically optimised for use on cameras with a Sony A mount and an APS-C sensor and is light, compact and easy to carry. The SAM (Smooth Autofocus Motor) ensures focussing is both fast and smooth and the focus mode switch allows greater creative control where required.